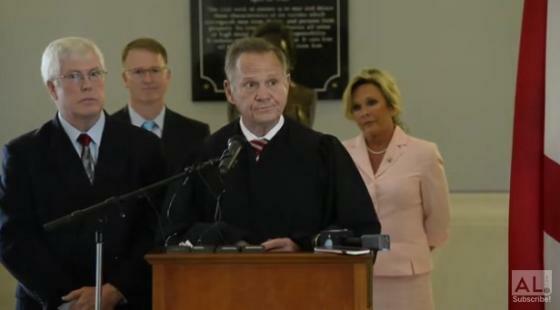 Today, the Special Court of retired judges, sitting as the Alabama Supreme Court, issued its decision affirming the Court of the Judiciary's (COJ) September 30, 2016, opinion imposing a lifetime suspension for Chief Justice Roy Moore. "This opinion and the entire case against Chief Justice Moore is a tragedy. For the first time in the history of Alabama, a justice has been disciplined for issuing an Administrative Order. Under this system, no judge is safe to issue orders or render dissents. The system has to change, and politics should be removed from judicial decision making and disciplinary actions," said Mat Staver, Founder and Chairman of Liberty Counsel, which represents Chief Justice Moore. This politically-motivated punishment has stripped Chief Justice Moore of all income and benefits since September 30, 2016. The "suspension" imposed against the Chief Justice is the longest suspension in the history of Alabama. The COJ admitted it did not have a unanimous vote to remove the Chief under COJ Rule 16, so the COJ suspended him for life. Removal or suspending for life is the same thing. And now, the Special Court allows the COJ to violate its own rule.